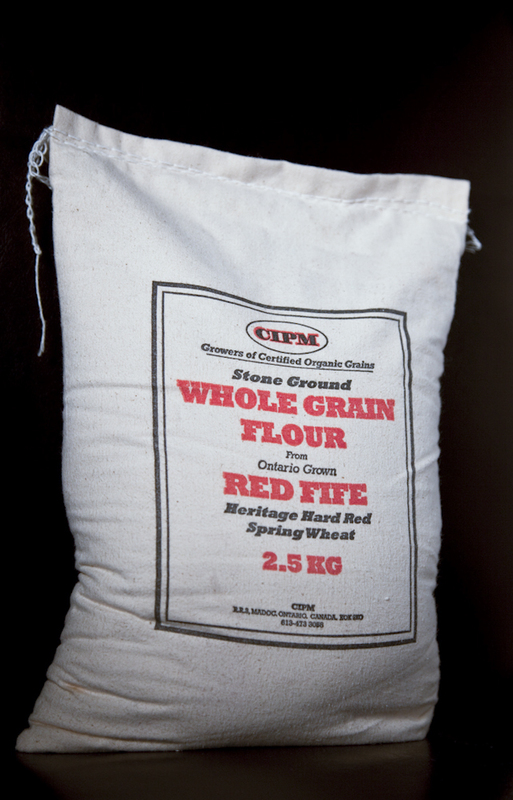 But back to Red Fife: here is a flour that any respectable foodie must get to know – especially if that foodie calls herself a Canuck. Red Fife is a Canadian heritage wheat first planted by David Fife in Peterborough, Ontario in 1842. From 1860-1900, Red Fife enjoyed its heyday as the nation’s wheat of choice. It set the standard in both milling and baking. But once the century turned, so did Red Fife’s popularity. It was pushed out of first place by its decendant, Marquis, which came to harvest a week earlier. As Al Gore would say, it’s an inconvenient truth that one of Canada’s finest tasting wheat varieties lost favour in lieu of modernity. I never thought much about whole wheat’s flavour until I baked with that first bag of Red Fife. I put it into my “house loaf”: a sweet combination of oatmeal, honey, white and whole wheat flours. When Nick, the supertaster in our house took his first bite he asked, “Did you add cinnamon?” It may have been the power of suggestion, but I too detected faint glimpses of that spice tucked inside the crumb. But to Slow Food, Red Fife isn’t just any old wheat variety. It is a member of the esteemed Ark of Taste and is a “presidium project” meaning Slow Food plans to bring this variety out of obscurity and into economic (albeit artisanal) significance. Considering Red Fife was absent from Canadian farm fields for more than eight decades, Slow Food is a miracle worker. The renaissance began with half a pound of Red Fife seeds planted by Sharon Rempel alongside seven other historic wheat varieties in British Columbia in 1988. Two decades later, 500 tons (or a million pounds) of Red Fife wheat were harvested in Canada in 2007. Of course, 500 tons is a mere drop in the bucket when it comes to a wheat growing nation like ours, but to a foodie like me, those numbers offer up taste and opportunity. But how much? Whether it’s wine, olive oil or whole wheat flour, the only way to discern taste is a side-by-side tasting. So the other day, I made two loaves of bread. One loaf was made with 100 per cent organic Red Fife flour. The other was made with 100 per cent organic No-Name whole wheat flour. Why do I call it No-Name? Because most flours sold today are a blend of wheat varieties that are never listed on the label. Even more disheartening is that fact that whole wheat flour sold in Canada is not necessarily whole grain due to a ridiculously outdated piece of 1964 regulation which allows millers to legally use “whole wheat” on the label despite their removal of up to 70 per cent of the wheat’s germ!!! Fortunately, not every miller engages in this practice, but you have to do detective work to find out if the whole wheat flour you buy is actually whole. I called up Grain Process Enterprises Ltd (115 Commander Blvd, Scarborough, (416) 291-3226) and was reassured to learn that the organic stone ground hard whole wheat flour I regularly purchase at Strictly Bulk (683 Danforth Ave; (416) 466-6849) is indeed “whole grain”. Nevertheless, it’s still a No-Name because it’s a blend. I compared the sponges. Red Fife’s bubbles were tighter and smaller than No-Name’s. I compared the ferments. 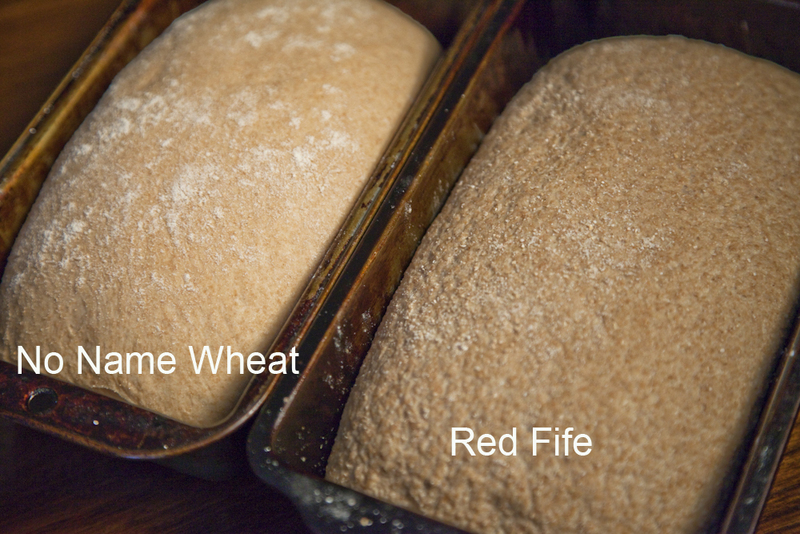 During the first and second rise Red Fife was slightly more sluggish and not as robust as No-Name. I compared oven-spring. Sorry, old Red Fife lost out in this department. While you can’t really see the difference in the cross-section photo here, you can see it in the first photo of this posting. The Red Fife loaf (forefront) is not nearly as puffed as the No-Name beside it, with perhaps as little as 30 per cent less oven-spring. I compared flavour, crumb and appearance. Red Fife is the winner. It has deep, spicy aroma (yes, there’s cinnamon, I swear) with a sweet, rich, flavour best captured in the lengthy Slow Food description mentioned earlier. Why can’t Red Fife rise like No-Name? I called up two Red Fife millers and learned that many factors influence a flour’s ability to rise, such as protein content, falling number (I won’t bore you with the details) and in the case of No-Name, the number of different varieties blended in the mix. Plus, if you’re using a store-bought package of No-Name whole wheat, chances are it isn’t whole grain and will rise better because it is more refined! Phew! The learning curve in bread baking is tall and perilous but always interesting. For those looking for a Red Fife loaf, check out Jamie Kennedy’s Red Fife Sourdough at Gilead Café (4 Gilead Place, (647) 288-0680) or taste the Red Fife loaf sold at St. John’s Bakery. And here’s my promise: send me a recipe for 100 per cent Red Fife sourdough and I will personally bake a loaf of that for you! In the meantime, here’s my best sandwich loaf recipe. Use the paddle attachment and mix at medium until combined, about one minute. Cover with plastic wrap and leave to ferment for 1 ½ -2 hours or until bubble-ridden like a sponge. Add salt and 3 cups of the flour to the sponge and mix with dough hook, adding more of the remaining dough, by the spoonful, until the dough forms and breaks away from the sides of the bowl, mixing for a total of 6-8 minutes or until the dough is puffy, shiny and elastic. Transfer to a large, oiled bowl or container, cover and rise at room temperature until doubled, about 2 ½ hrs. Gently deflate the dough. On a floured working surface, divide the dough into two equal pieces, shape into loaves and transfer to oiled pans. Cover with a tea towel and spray with a mister a few times to dampen lightly. Rise 1 hr. Thirty minutes before baking, preheat the oven to 425° F.
Just before baking, sprinkle the loaves with Red Fife flour and slash. Bake in the lower third of the oven. Spray the loaves with a mister twice in the first 3 minutes of baking. Bake 15 min. Reduce to 375° F and bake 25-30 min. more. This entry was posted in Bread, organic, Recipes, Red Fife Wheat and tagged bread baking, cinnamon, slow food, whole grains, Whole Wheat. Bookmark the permalink. I went to St Lawrence yesterday and saw that Rube’s Rice in lower level of the South Market also carried Red Fife. Laura, when you bake with Red Fife do you increase the leavener? I don’t. Don’t like the taste of too much baking soda. I just put up with the slightly flatter loaf. You’ve inspired me to try Red Fife again. We drive by the David Fife Road and the historic Red Fife plaque on Highway 7 outside Peterborough regularly, which got me interested in the revival of the wheat. But although my first loaves tasted great, they didn’t rise well. Should I have used a recipe with a longer rise time? I’m going to buy some of this flour for my mom who is still making bread at age 82! Thanks for all the details and information. I never knew flour could be this interesting! You don’t like the gorgeous patina on my well-used pans? Harumph! My grandmother cared for me and my siblings until I was 10. One of my fondest memories was of her baking bread. I often helped. I had two jobs. One was kneading dough, the other, sprinkling the loaves with sesame seeds. Kneading dough was so laborious. It took forever! Must have been her way of keeping me busy. I miss the smell of baking bread almost as much as I miss her. Has anybody been to Tyrone Mills, north of Bowamanville. That’s a beautiful century flour mill with all kinds of whole grain flours. Now you’re talking!!! I want to go. Did you? No, I don’t have a sourdough recipe yet, still searching. That is SOOOOOO cool that you belong to the Fife family line. Thanks for posting and I hope to blog more about bread soon. What is the shelf life and storage requirements for Red Fife? Last time I had “living” flour it went rancid before I could use it all up; a very sad experience – maybe I had too much in the house at once- it was a gift from my Mom upon returning from Manitoba. Harvest of 2010 ‘Faith’ Red Fife Boutique Wheat now for sale! Ehnes Organics (Etzicombe Alberta) and Sharon Rempel, godmother of today’s Red Fife movement are pleased to offer you an opportunity to purchase Canada’s first ‘Boutique’ wheat – ‘Faith’ Red Fife, grown directly from the foundation Keremeos strain, the ‘mother’ of today’s Red Fife wheat strains. When buying Red Fife seed one must always ask ‘where did the seed originate’ and most of the seed in Canada comes from the ‘Blais’ Red Fife strain, which contains about 80% of the Keremeos strain as well as other strains. This year’s harvest has a unique flavor profile with the robust rich ‘wheat’ taste from the deep red kernels, with a blend of subtle mellow lightness from some kernels that germinated a few days later and developed red ends. The blend is unique to this growing area and this year’s climate. We have 70 metric tonnes available for purchase (154,000 pounds). That’s it for 2010. We estimate protein 12% and lab and baking test results will be available by October 20, 2010. Like all beautiful and rare things on earth our limited quantity of Red Fife reflects the care and attention taken in ensuring the seed purity is the best on the market. Our price is $50/bushel or $1/pound ($2.20/kg) plus freight. Tote prices may be slightly less depending on volume ordered. Ehnes is able to ship anywhere in the world. Regarding the use of red fife only, I am trying to distinguish between starters used in traditional sourdoughs and desem starters, which are heavier, not with RF, and the process a bit different. I haven’t found the perfect marriage creating a starter using RF, plus a no-knead and ideally one loaf quantity. Road to heaven anyone. Judy et al, we’ve been fortunate to grow Red Fife heritage wheat on our farm since 2001 and have marketed it all over North America, including to numerous Ontario farmers and distributors including CIPM Organic Farm whose cloth bag of flour is pictured at the beginning of Mado’s excellent blog posting. We have been supplying Grain Process Enterprise in Scarborough, on an ongoing basis since Feb 2007, with high quality milling Red Fife. We’re also involved in Slow Food and in the Red Fife Wheat Presidium, and are exited to be helping to start Saskatchewan’s first convivium for Saskatoon and area. We have a number of recipes, including one for sourdough bread, that we could share with you via email attachments. We’ve also been repsonsible in the renaissance of Marquis heritage wheat and have begun marketing it also. We also grow other heritage crops like fall rye, and heritage/rare breed animals like Dexter cattle and Chantecler chickens. The Brickworks farmers market also has a few stalls that sell red fife flour as well as breads already made with the flour. I just tried your sandwich bread recipe. Is the dough suppose to be quite sticky and moist still after all the flour has been added? I had to add an extra cup of flour (7.5-8cups total) for the dough to be manageable. That’s a LOT of flour for only two loaves! Hope you found your Red Fife sourdough recipe! I just picked up 3 kg and plan to do a 100% red fife bake later this week so let me know if you want the detailed recipe. I am still searching for a 100 per cent red fife sourdough and would love to see your detailed recipe. Have a happy bake with your 3 g! thank you! We just received our order of Red Fife kernels from Speereville Mills in New Brunswick. Started grinding our own flour and we were looking for a good bread recipe. Will definitely try this one! Thanks. Hubby just got our very 1st bag of red fife from a farm share program. I am normally a sour dough only baker, so I did a bake test with 5 cups of red fife and 1 cup of unbleached starter. it tasted great, quite a bit smaller loaf than using white unbleached, but definitely a great tasting loaf. Could you do this recipe in the bread machine? I have a 3 pound machine. Sorry, this recipe is not designed for the bread machine. This would be perfect if only you would use “sourdough starter” to make your bread. By using supermarket yeast you are introducing preservatives in your bread, which are unhealthy, and can cause problems for the digestive tract…..
We are using organic red fife from Richard Birley in Baldonnel near Fort St John BC. 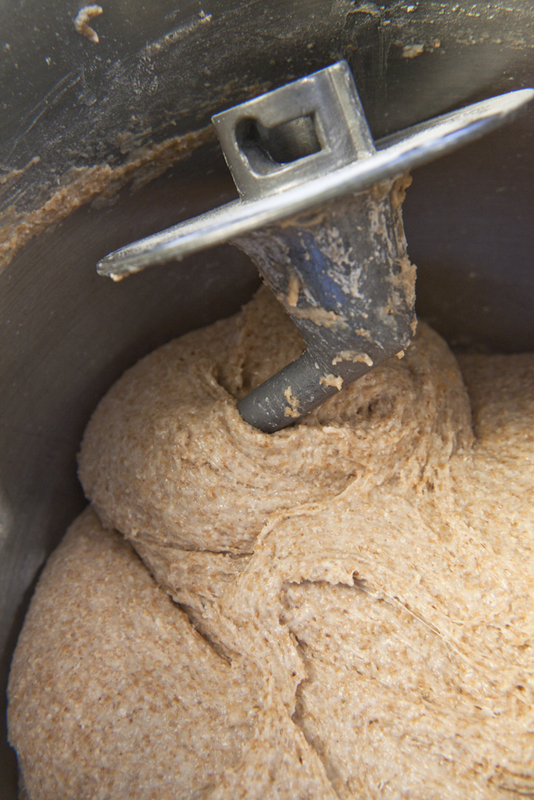 We buy whole grain and grind it ourselves using our Victorio grain grinder. 10 to 12 c of flour makes 3 large loaves. Lemon juice makes a great dough conditioner. No problems rising the loaves. Excellent taste, lovely texture and very habit forming. 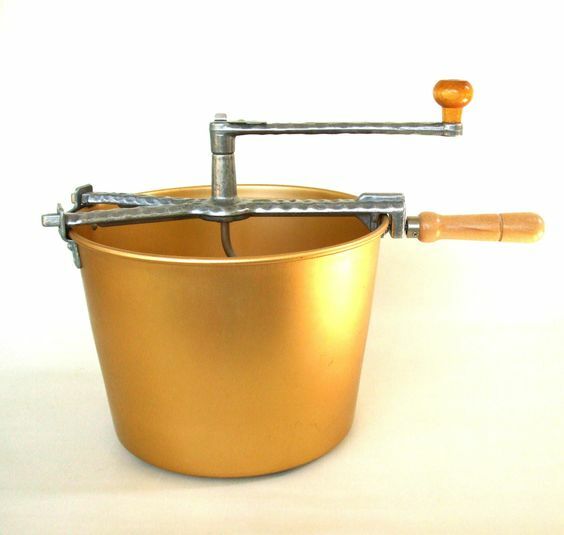 I’m cranking my dough in an old Mirro bucket. Most recipes with power mixer instructions require additional kneading when they come out of the Mirro. Is this dough suited to a bit of hand kneading? I have never ground my own Red Fife flour but I would certainly recommend hand-kneading this. Pls let me know the results! Finally got around to making this. I used regular yeast which seemed to make little difference judging by the pictures. It took about 5 minutes of kneading after turning it out of the mixer but I might try a little less next time. The loaf is about 2 1/2″ tall. The flavour as promised is wonderful but since it’s so short it probably won’t be the house loaf but it will be a regular. FYI, I posted way back in June 2012. We’re long time growers and marketers of Red Fife heritage landrace wheat. 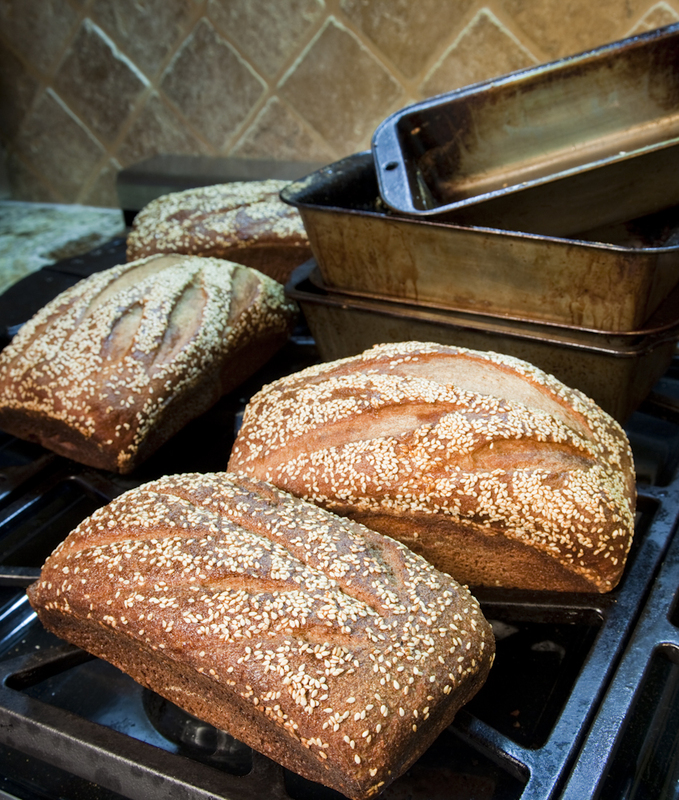 Your loaf rise will depend on numerous factors. To start with it will depend on the wheat quality, ie: protein content (should be a minimum of 12.5% and can be up as high as 17%… we had 14 to 17.1% with Fife and Marquis this year. …. and the falling number (enzymic activity that may have occurred in the seed prior to harvest) The FN should be a minimum of ~250 and can range as high as in the 400s. Further, it is important not to knead if for too long as that will affect the rise. Additionally, do not add too much flour to your dough! We find that most often when we get calls inquiring about how to better succeed with the bread-making, it’s because they add in too much flour. The dough should remain really sticky. The trick to working with your dough then is to oil your work surfaces and hands. (yields 4 loaves) *this recipe designed for bread mixers like Bosch kitchen machine which we own and love using. Cover and let rise in a warm place for ~20 to 30 min. Form into 4 round loaves; let rise for 25 minutes (or up to ~40) Preheat oven to 375 deg (190 C), bake for 25-30 min. until golden brown. Great info! Thank you for the recipe!! Pls let us know where we can buy your four! Do you ship across Canada? This is so interesting to read. I bake my own bread for more than 15 years and started this year with stone milling my own home grown spelt , red spring wheat and Red Five! I sell on the farmers market in Lethbridge AB on Saturdays and you can also order on my website. Delivery is only possible for around and in Lethbridge.